"Instead of imagining that our main task is to instruct a computer what to do, let us concentrate rather on explaining to human beings what we want a computer to do"
A computer does not care about code readability, but humans do. If a great program is written which works perfectly on a computer but no human can easily understand the logic other than the programmer who wrote it, then such a code is almost useless. Notebooks provide us the ability to write documentation as a narrative text, along with the code which makes it easy to understand the analysis. This is not only useful for the people reading your notebooks, but also for yourself when you refer to your analysis in the future. Pre-requisite for the next step: Anaconda is installed and you are able to invoke JupyterLab. Refer to the Previous lesson for details. 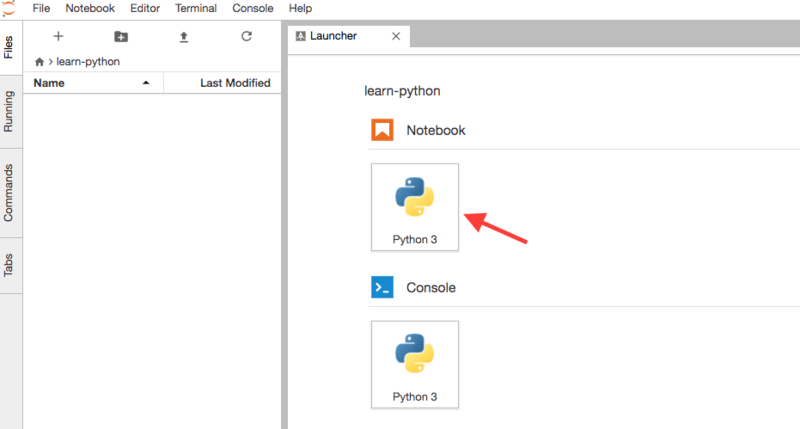 Let us start our first notebook by invoking Python 3 button under the Notebook symbol as shown below. This will create a new file in learn-python folder with the name Untitled.ipynb by default. Change this name to firstConcept.ipynb by right clicking on the file and selecting rename as shown below. 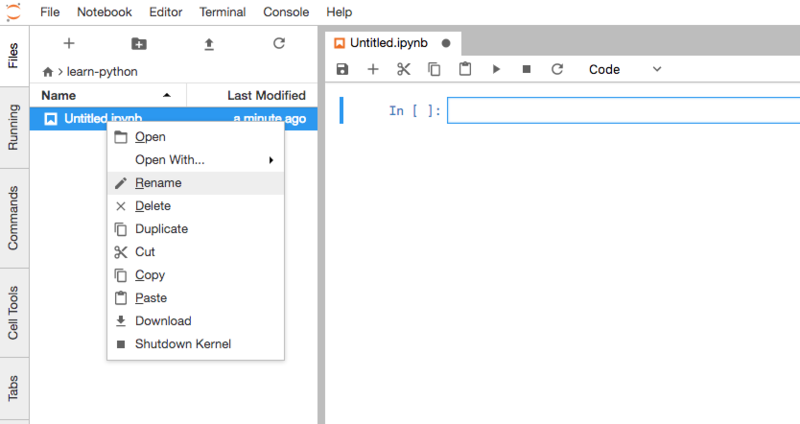 ipynb file extension is a notebook document used by Jupyter Notebook application. It contains all the information produced by Jupyter Notebook during a web application session which includes blocks of code, outputs from running the blocks of code, narratives, images, equations etc.. Contents are stored in plain JSON format. .ipynb files can be exported to other formats like HTML, PDF etc., as shown below. Once exported it is easy to share your work with others and also display it on the Web. Press Ctrl+enter to run the calculation. You will notice a number within In[x] next to the code cell. x in this block contains a number which indicates the number of times that block is executed. If a block is still executing then you will see * in place of number. Once the execution is finished it increments to the next number. 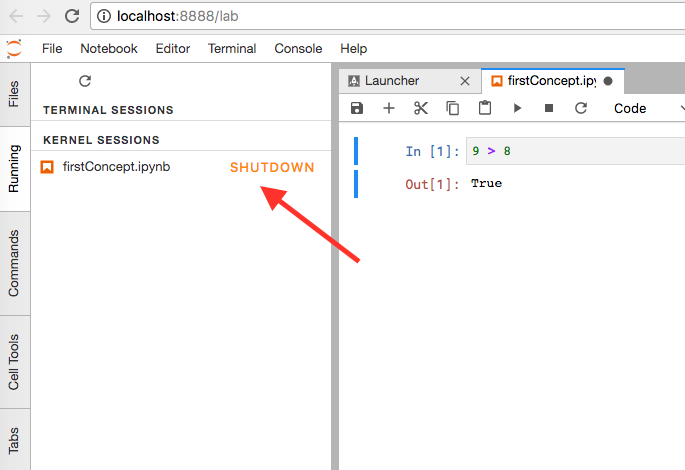 You can add as many code input cells as you need in JupyterLab. 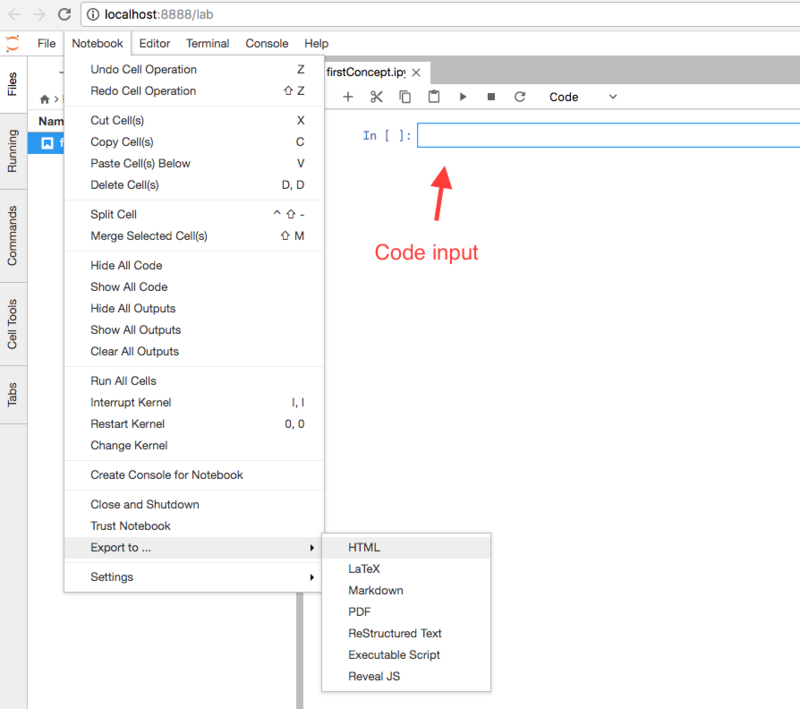 In addition to code input cells, you can also add Markdown cells for narratives and Raw cells for code which is used for display only and not for evaluation. Both Markdown cells and Raw cells are not interpreted by Python Kernel. There are more commands available in the same menu. Check them out. Help menu provides quick links to rich reference material of libraries and applications used for Data Science. # comments do not get executed. You will notice that a print command was not required to see the output. Interpreter always outputs the last computed value and it also makes it available with a builtin variable _ which comes handy in case of interactive computing. Notebook is a Web server. Web Server is nothing but a process which runs in an infinite loop and listens to user&apos;s connections from a browser. When it receives your request from the browser for a Web page, server returns a response HTML document. The server itself is not capable of running the Python program. Instead it opens a connection to Python Kernel and submits the code part of the Notebook to be processed by the Kernel. Once the Python Kernel processes the code, the Kernel returns the results back to the server. The server then returns the results to the browser. Browser displays it to the user. To stop the notebook server and the kernels of all notebooks, press Ctrl-C twice in the Terminal (Command prompt) console. Make sure your work is saved before shutting down! You can also create a plain text file with just Python code in it and save it with .py extension. You can run this program on Python kernel by opening the Python interpreter from the Command prompt or Terminal by typing python or python3 and the name of the file. Create a file called hello.py in any directory from any text editor of your choice and type in print("hello") and save it. Now from the Terminal or the Command prompt, navigate to the directory where you have the file saved by using cd. Once you are in the correct directory ensure that the file is present in that directory by running ls in Mac/Unix/Linux or dir in Windows. Then run python hello.py and you should see "hello" printed on the console.